"OCEAN FRONT - STEPS TO SAND BEACH"
Bathrooms: 3 "plus 1/2 bath"
This beautiful home is ideal for a vacation rental or for the family wanting to live just steps from the pristine sand beach that is directly in front of this home. This property has everything. Swimming pool, imported Italian marble floors and marble bathrooms, top of the line appliances, faucets and accessories. 9 foot ceilings, custom granite kitchen counter tops, hide away sliding doors, high efficiency insulated windows, 2 car garage with electric door opener etc. 3 bedrooms with 3.5 baths and built to US standards. Just minutes away from the shopping and restaurants and active night life of Jaco Beach. You will truly enjoy the magnificent ocean breezes and tranquility of the outdoor living area in this uniquely designed tropical home. Only the best materials and the highest quality of workmanship. 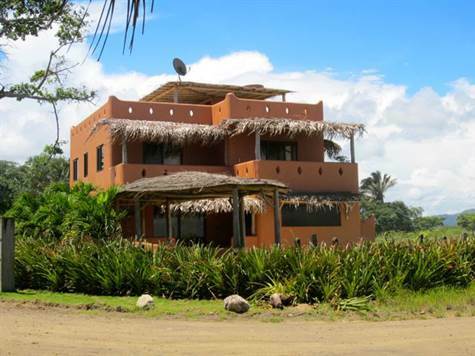 This home is located in a very special area that is ecologically protected due to the turtle nesting on the beach..
Property size approx 5649 sq ft.